In Stephen Pinker’s book, The Blank State, he took aim at the notion of nurture being all powerful; that we are born in compliance with the environment we inhabit. Pinker argued that the new cognitive sciences showed we are determined by what we inherit. Not being a scientist myself, I learned a lot without feeling I was being taught (do you know what proprioception means? I didn’t). The poem, ‘In Tune’ uses the metaphor of a novice bell ringer learning their trade, to show how our bodies are often not in tune with themselves; if we injure ourselves for example, in this case a sprained ankle, our body has to relearn how to co-ordinate as a whole. But Hershman has another arrow in her quiver of talents, in bringing fiction into the orbit of poetry (a welcome addition in my opinion). Her previous books have been short stories and flash fiction, and she is holder of the wonderful ShortStops website of short fiction resources. I wondered if her writing of fiction was an antidote to the truth of science, where she could break free. But of course, the divide between fact and fiction is not so binary, and poetry is well practiced in the combination of the two. The Primers’ poet, Katie Griffiths introduced me to the idea of reading poetry in terms of its subjectivity and objectivity, where parts of the poem may be statements of facts, whereas others will have metaphor and simile. The poem, ‘For which we have no names’, seems to perfectly encapsulate this mix of science, fiction, subjectivity and objectivity. when they say jealousy, when they say love? Love is also dealt with in an almost mundane way. In the poem ‘Body’, for example she describes being with her mother who is at the hospital for tests. to cover where her breasts had been. open itself out to me. These major themes of uncertainty and control about our futures are the veins that run through the book; what we have to deal with, and how we go about it. The ‘woman in the bath’, one of; the shortest poems in a book, packs so much into a scene of doing just that, having a bath the control of the hot and cold water she gives in to, but then in the middle of the poem, when she is floating the impact of three words, ‘Yes, the womb’. Is it about childbirth, or the flushes of a menopause? Either way, the extent to which we have control, or not over our bodies is beautifully captured in forty-one words. Similarly, the poem ‘What we don’t know, we don’t know’, which has echoes of Donald Rumsfeld, and Nick Lantz’ collection of the almost same title (bar the placing of ‘What’), reflects the uncertainty of all meaning. The form is very clever; three poems in one which neatly compounds the uncertainty of its content and how we should read (into) something. Which then begs the question of what is normal anymore, to which Hershman answers in the poem, ‘Missing You’, where she has a dig at scientists in terms of boundaries of recovery and how much of us is really needed to live a fulfilling life. Based on a true story of a woman who had half her brain removed when a child, to stop persistent seizures, in the poem she is now in her twenties, married with two children. She can still breathe and seems to be doing quite fine thank you very much. There is nothing fake news in the message of this collection. 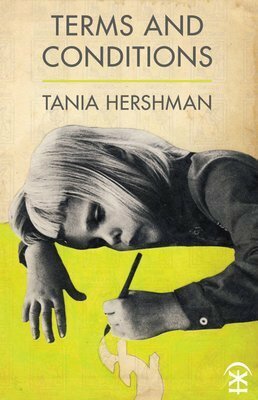 Tania Hershman has written a tightly conceived, perfectly formed set of poignant poems that question modern day (virtual) reality. It is scary, which makes it all the more urgent, for as one of the book’s characters says, ‘Who am I? Tell me my name’. We need to find out who we are, and soon. are liable to dance always and forever change. Maybe Stephen Pinker has the answer, but he should at least read Terms and Conditions. Or maybe we should ask ‘Baby’ to evaluate the world they are now entering. Yes, let’s do that. PS: The book has endnotes, yes, endnotes, in a poetry book – read on! You can buy Terms and Conditions from the Nine Arches website.